Your wedding ceremony has come to an end. You’ve shared your vows, exchanged your rings and even kissed for the first time as a married couple. The next sound you hear will be your recessional song. This is the last song of the ceremony and, in many ways, the first song of the celebration. Especially if you are getting married at the same location of your reception, you and your guests will go immediately from the ceremony to your cocktail hour. And so the recessional song is the hinge. It will be the first song you hear as a married couple. And it will be the beginning of your party. 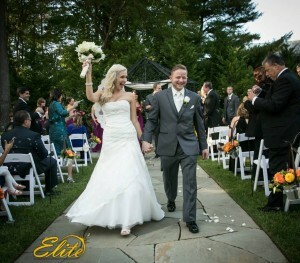 At Elite Entertainment we play the music at over 300 wedding ceremonies every year. Currently almost 50% of our weddings include ceremony music. And that number just keeps growing. More and more brides and grooms are getting married outside of a traditional church or temple and so we get the opportunity to work even closer with our couples, crafting not only the reception music but the songs that will be played before and during the ceremony. We enjoy this process. The ceremony is the true beginning of your married life and so for many reasons it is the most important part of the wedding day. The songs that are played before the ceremony are called “Prelude Music.” Traditionally, we played classical music although nowadays many couples want a more modern approach. We can play some New Age, contemporary instrumentals and/or some classical renditions of modern songs like those produced by The Vitamin String Quartet , 2 Cellos or The Piano Guys. We emphasize to our clients not to stress over these selections. 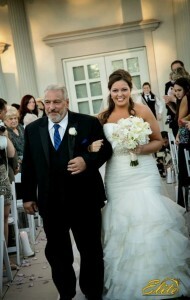 We’ll provide a nice mix for you that will be volume appropriate and set a beautiful and romantic tone for the ceremony. Plus, you won’t be there to hear any of it so there’s no point in playing your favorites. The ceremony officially begins with one or two processional songs. Usually it’s two songs: one for the bridesmaids to walk down the aisle, and then the song for the bride’s entrance. Some couples will just have us play the same song throughout, especially if they have a small bridal party. Again, the processional songs used to be classical pieces, and they still can be. Pachelbel’s Cannon and Wagner’s Here Comes the Bride are still common selections. (BTW we have tons of versions of “Here Comes the Bride”, everything from traditional church organ sounding to strings to a very cool steel drum version which is perfect for beach weddings.) But more and more we are seeing brides who want to come down the aisle to something more modern. For example, in recent years Train’s “Marry Me” (with that great opening line “Forever can never be long enough for me”) has been requested a lot. We’ve also used some of the instrumental tracks from The Twilight movies (like “Bella’s Lullabye”) and The Piano Guys cover of Christina Perri’s “Thousand Years” has been a very popular selection as well. 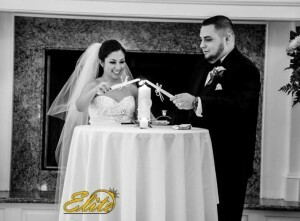 This is a very special moment, obviously, so we encourage our couple’s to personalize it with a song that is meaningful to them. And it doesn’t have to be a slow song although that moment is very elegant and serene so an up-tempo song might seem out of place. During the ceremony, we are sometimes asked to play a background song if there is a candle lighting ceremony or Hawaiian Sand Ceremony. We recommend a light instrumental piece for this because the song is often on for less than a minute. It’s just an elegant little filler. Which brings us back to that recessional song. Again, we encourage the couples we work with to give this selection some thought. We hope you can personalize that moment with a song or an artist that is meaningful to you. And unlike the processional, tempo is unimportant here. In fact, we recommend something mid-tempo or even a faster beat. If you are sticking with tradition and want to use a classical piece, Mendelssohn’s “Wedding March” (another song we have plenty of versions of) or Beethoven’s “Ode to Joy” are just two of the many great choices we can recommend. But so many couples break tradition here and go with something more modern and fun. 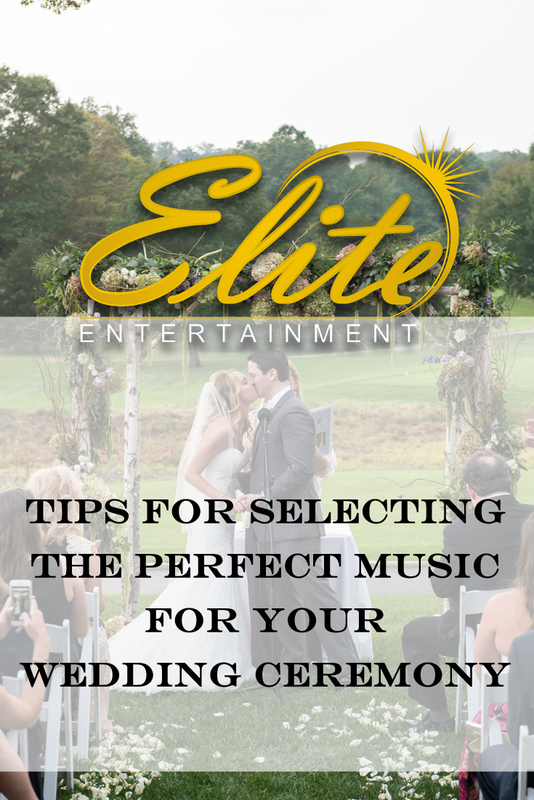 Remember, designing the music for your wedding ceremony is something we enjoy doing at Elite Entertainment. We like the collaborative effort of your ideas and our experience combining to make the perfect list. That moment should be perfect. So let’s work on it together.